I finally finished my brick path quilt last night. I will have to wait until tomorrow to get some good pictures, hopefully there will be sunlight, but I was so happy to finally have it done that I did my best with my limited photography skills and got some pictures so I could post. It was pretty straightforward to finish this, and thankfully there was no binding to do, although I had a terrible time getting those pom poms sewn into the corners. And as you can see from my close up, one little pom pom thread still escaped. 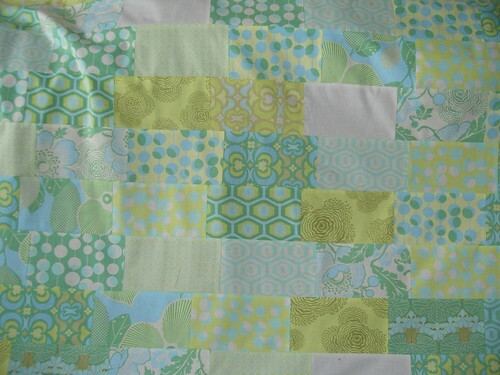 Also, when I washed and dried the quilt after I was done, the pom poms got all linty. I tried my best to get the lint off, but they still look a little dirty, which makes me a little sad, because I was really into those pom poms! 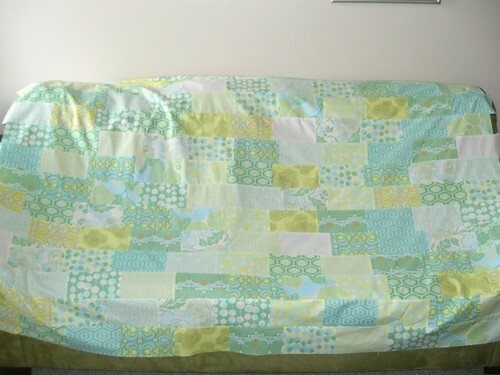 I guess if I make another one of these quilts, I will leave them off. 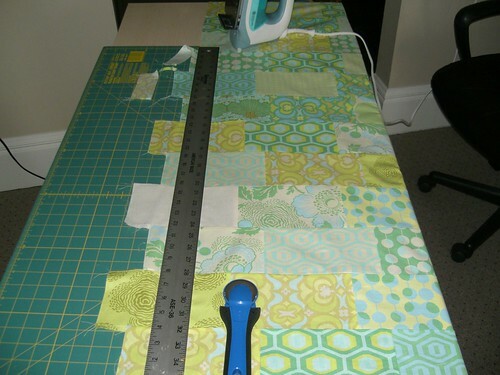 Its becoming increasingly apparent that until I move into a house or bigger apartment, I’m only going to be able to make lap-sized quilts or smaller. 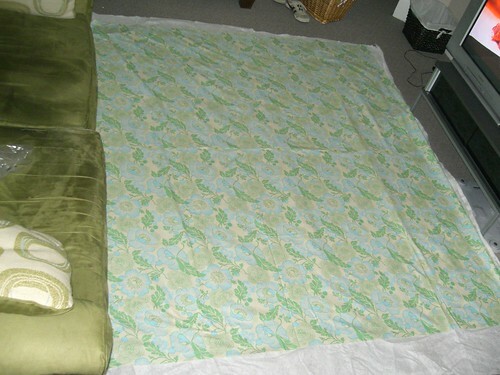 I dont have the room to lay out the quilt to baste! That’s the biggest open area I have in my apartment, after I move the coffee table. I live in a one bedroom apartment so there’s only 4 rooms, the living room being the largest. As you can see, after laying out the batting and the backing, there’s not room for much else. I am standing in my windowsill to take this picture. ( I have a huge windows at the far end of my apartment that fill this entire wall, with a low wide sill.) You can also tell I quilt with the tv on. Shameful, I know! I really like how the top turned out, even though my “random” assembly ended up having a lot of repeats in the end. I laid it out on the couch for this picture so you could see have soft and pretty all the colors are. Squaring up the quilt was really easy. You can see my sewing table is really an old crate and barrel desk, I wish it was wider, but at least its long enough to get the job done. In then end, I am happy with how it turned out, problems and all. 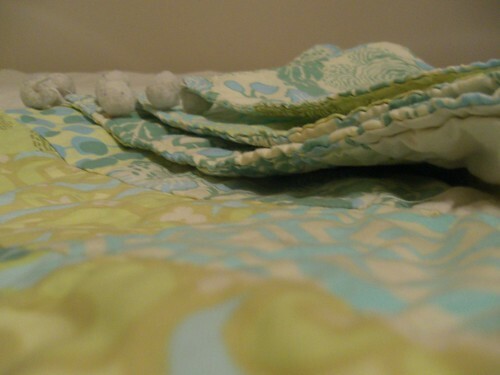 After washing it there was an issue with the pom poms and a seam on the edge of the quilt that I had to fix, and I also noticed that I forgot to quilt one of the rows! After correcting all the issues, it turned out so cute. 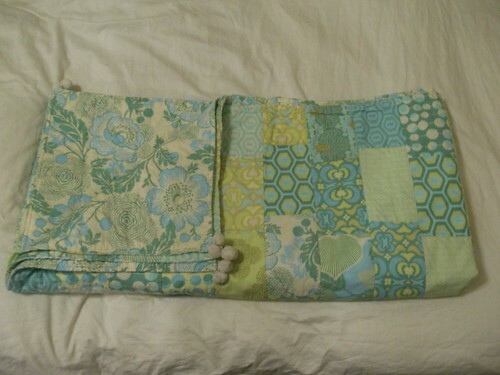 I think its a perfect springtime quilt, and I am so over winter right now, its just the thing to perk up this grey time of year.